Kenya’s landscapes are rich in diversity. Almost every known landform exists within this world in miniature, from snow-clad mountain and glaciers to arid deserts, from dry savannah to lush lakes and dense forest. The Great Rift Valley, its floor littered with lakes and extinct volcanoes, cuts through Kenya from north to south. On the Equator majestic Mount Kenya (5,199m) with its snow-capped peaks rises above endless grassland plains. To the north is the rugged and remote Northern Frontier District including Lake Turkana, “”The Jade Sea”” its blue green waters in stark contrast to the arid surroundings. To the west is Lake Victoria, the largest of Africa’s lakes and the legendary source of the Nile. The famous Masai Mara Reserve to the South West is the Northern extension of the Serengeti. To the South, the Indian Ocean coast offers sandy white beaches, and turquoise seas protected by a fascinating coral reef. These and the historical cities of Gedi and Lamu, all combine to make this one of the world’s great holiday destinations. Above all there is the wildlife. This prime attraction is conserved in 37 National Parks and Reserves throughout Kenya, large tracts of wilderness set aside for the protection and preservation of the remarkable variety of indigenous flora and fauna. The abundance and variety of animal species and scenery vary from the famous wildlife spectacle that is the Masai Mara, to the ornithological paradises of the Rift Valley lakes. Differences in terrain and altitude create contrast in the climate, from the hot humidity of the coast to the cool – sometimes frosty – mornings of the central highland country and dry burning heat of the northern desert. Overall, it is seldom harsh, being neither too hot nor too cold. With long sun filled days, it is an almost perfect climate. In almost every part of Kenya there are hotels which compare with any in the world. Many are internationally known, some are architectural masterpieces and some are tented camps offering true luxury in the bush. All have one aim in common, to offer the best comfort, quality and service in the true spirit of safari. Nairobi, Kenya’s capital is located 140 km (87 m) south of the Equator, but its altitude of 1,670 meters (5,500 feet) above sea level ensures an exhilarating climate. Nyrobi, a Masai word for “”a place of cool waters”” was born in the spirit of adventure in the days of the early pioneers less than 100 years ago. It quickly grew and is today one of the most important cosmopolitan and vibrant cities in Africa with a growing population, currently estimated to be 1.5 million consisting of many cultures and nationalities. Nairobi is a city of great contrasts with striking modern high-rise buildings, with reminders of the early days. Look for the Law Courts and Parliament Buildings, the Jamia Mosque, the City Market with its array of tropical fruit and flowers and the famous Norfolk Hotel, linked with Kenya’s History since 1904. All about the city are public parks and gardens, full of shrubs and flowers, and the main routes out of the town are tree lined avenues. The city is an important business and social centre with a range of international hotels and conference facilities, including the Kenyatta International Conference Centre. Most of the leading hotels offer gourmet cuisine, but for visitors who wish to dine out the choice is appealing – superb seafood, a wealth of sophisticated restaurants serving French, Italian, Indian, Chinese and other international and ethnic cuisines. Just outside the city is the popular Carnivore Restaurant, a Brazilian – style churrascaria serving a wide variety of meats cooked on open charcoal pits, and one of the few places in Kenya to offer game meats. Nairobi is served by two airports – Jomo Kenyatta Airport used by international and domestic carriers and Wilson Airport the base for other domestic air services and private air charters. The Aberdares are a beautiful mountain range in the central highlands of Kenya, for the most part, over 3000m (10,000ft) in altitude. Within the heart of these mountains is the Aberdares National Park, a magical place of dense forest, and misty moorlands, where icy rivers plunge in glorious cascades and waterfalls. This area is rich in wildlife. Amongst a variety of mammals more commonly seen are elephant, buffalo, rhino, forest-hog, colobus and Sykes monkeys and a wide variety of antelope including the legendary and rare bongo. Birdlife is abundant and varied. 200 species have been recorded, perhaps the most conspicuous group of which is the sunbirds. Birds of prey such as the crowned eagle, mountain buzzard and African goshawk are of special interest. A game viewing drive, possibly en route to Treetops or the Ark, is a worthwhile inclusion. Aberdare Country Club – A romantic, quiet and relaxing getaway with a game sanctuary. Guests stay in cozy grey stone cottages nestling among lush gardens. The Ark – An architectural masterpiece standing high above ground in a secluded forest glade where viewing of wildlife takes place at close range. Not recommended for children. Treetops – Overlooking water-holes and a salt lick, this is a functional lookout lodge solely dedicated to game viewing at close range. Amboseli National Park lies below the most famous symbol of Africa – Mount Kilimanjaro 5,895m (19,340 ft) the highest mountain in Africa and the tallest free standing mountain in the world. The surrounding area is flat, covered by savannah and acacia scrub and the animals stand in silhouette against this towering majestic giant, its snow-clad peak floating in the stark blue African sky. A large part of the park consists of the alluvial dried-up bed of the seasonal Lake Amboseli, which in the rainy season can transform into a shallow flood whilst the dry season brings strange mirages above the lake’s dry shimmering surface. Towards the centre of the park are a series of swamps, fed by the underground rivers running off the mountain. It is here, closer to the water, that the concentration of wildlife intensifies, from the ever present ponderous herds of elephant to abundant birdlife. This includes a wide variety of water birds such as grey heron, saddle bill stork, Egyptian goose as well as long-toed lapwing., yellow throated sand grouse and up to 6 species of vulture. The rare Madagascar Squacco Heron is a frequent visitor. Other game frequently seen include buffalo, zebra, wildebeest, gazelle, Masai giraffe, lion and cheetah. 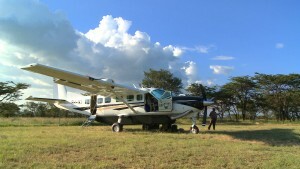 Masai Mara National Reserve is situated to the west of Nairobi, on Tanzania’s northern border. This 1,812 km² (700 sq. miles) Reserve is the northern extension of the larger Serengeti National Park – a massive 56,000 km² (5,600 sq. miles). The Masai Mara offers wonderful scenery and an abundance of big game. It is perhaps the only region left in Kenya where the visitor may see animals in the same super-abundance as existed a century ago. It is a reserve of breathtaking vistas, panoramas of vast rolling plains, hills and woodland groves, well watered by the lovely Mara River which bisects the Reserve from north to south. The Mara is home to the largest population of lions in Kenya, these magnificent beasts spending most of the day sleeping in the shade of acacia trees. Vast herds of buffalo, zebra and wildebeest roam the plains. Impala, gazelle, giraffe and hartebeest grace the landscape, the cautious topi may also be seen standing sentinel on earth mounds on constant look-out for predators. The waters of the Mara River are home to crocodiles and pools of hippo, the acacia woodlands and riverine forests favored by leopard and elephant, and the open savannah and dry bush areas host to the plains game and their attendant predators such as lion, cheetah, hyena and jackal. The birdlife of the Mara is as profuse as the animal life. On the open plains there is a variety of bustards and ground hornbills. Birds of prey are abundant – no less than 53 species have been recorded, including the magnificent Bateleur eagle. In the sky there are always opportunistic vultures circling and waiting in anticipation, and distinctive secretary birds are a common sight as they stalk sedately over the open plains. Situated between Lakes Naivasha and Baringo, beneath the high cliffs of the Eastern Rift, lies Lake Nakuru. This is a shallow soda lake surrounded by yellow-barked acacia woodland and grasslands, rocky cliffs and hillsides covered with the unusual giant Euphorbia trees. 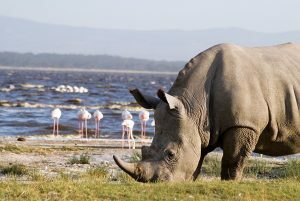 Lake Nakuru is world famous as the home of myriad flocks of greater and lesser flamingos which frequently form a stunning pink ribbon along the edges of the lake. But flamingos are unpredictable and are not always found here in such vast numbers – they migrate up and down the Rift Valley from Natron to Turkana in search of the best food supply. An entertaining spectacle is the large flocks of pelicans found fishing and washing at the southern end of the Lake. Over 400 species of birdlife have been recorded at the lake, making this yet another of Kenya’s major ornithological sites. 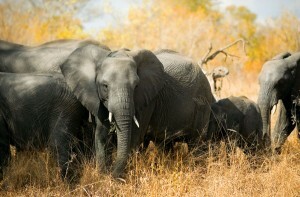 In addition to the birdlife, the park is home to herds of buffalo, waterbuck, impala, Rothschild giraffe, and leopard. A defined area of the park has now been designated a rhino sanctuary. Kigio Wildlife Conservancy is a noteworthy 3,500-acre conservancy between Nakuru and Naivasha in Kenya. The beautiful Conservancy with its wide ranging habitats, from riverine and euphorbia woodlands to short grass and Leleshwa shrub, holds approx. 3,500 heads of wildlife (including the endangered White Rhino and Rothschild Giraffe, a 200 strong herd of buffalo, impala, Grants and Thomson’s gazelle, eland, hyena, leopard, hippo and over 200 bird species) which are protected by an electric fence on three sides and the Malewa River on one. The Conservancy’s rich bio-diversity has been recognized internationally by Tusk Trust, Born Free Trust, Lewa Wildlife Conservancy and several private donors who have provided funds to improve the infrastructure in the conservancy and to help wildlife conservation and surrounding communities. The Conservancy is at the forefront of Eco-tourism in the Rift Valley lakes area. Rugged and remote, these wildlife reserves lie within the fascinating semi-desert area of Kenya’s Northern Frontier District. The Samburu National Reserve – a lava plain with steep-sided gullies and rounded hills – is physically dramatic with the great Ololokwe table mountain in the background. The central feature of the reserve is the winding and looping Ewaso Nyiro river. On either side of the river, a green ribbon presents a gallery of forest acacia, doum palm and Tamarind, which act as host to a multitude of birdlife. Some of Kenya’s rarer species like the long-necked gerenuk, Grevy’s zebra, reticulated giraffe, beisa oryx and blue-shanked Somali ostrich can be seen here. The Buffalo Springs Reserve butts onto Samburu in the south and is more or less an extension of the same kind of environment. However, as the name implies, the major source of relief in this reserve is an outflow of clear spring water which attracts migrant game and predators from miles around. This reserve is bounded in the north by the Ewaso Nyiro which doesn’t reach the sea but buries itself into the Lorien Swamp to the east. Shared Borders: Uganda, Tanzania, Sudan, Somalia, Ethiopia. Highest Elevation: Mt. Kenya – 5,199 m.
Terrain: Plains along coast; central plateau; highlands in north, south. Kenya is generally a dry country; over 75% of its area is classed as arid or semi-arid with only around 20% being viable for agriculture. Inland, rainfall and temperatures are closely related to altitude changes, with variations induced by local topography. Generally the climate is warm and humid at the coast, cool and humid in the central highlands, and hot and dry in the north and east. Across most of the country, rainfall is strongly seasonal, although its pattern, timing and extent vary greatly from place to place and from year to year. The relatively wet coastal belt along the Indian Ocean receives 1,000 mm or more rain per year. Most rain falls from April to July as a result of the south-easterly monsoon. In much of the central highlands, the rainy seasons are in March-May and October-December.